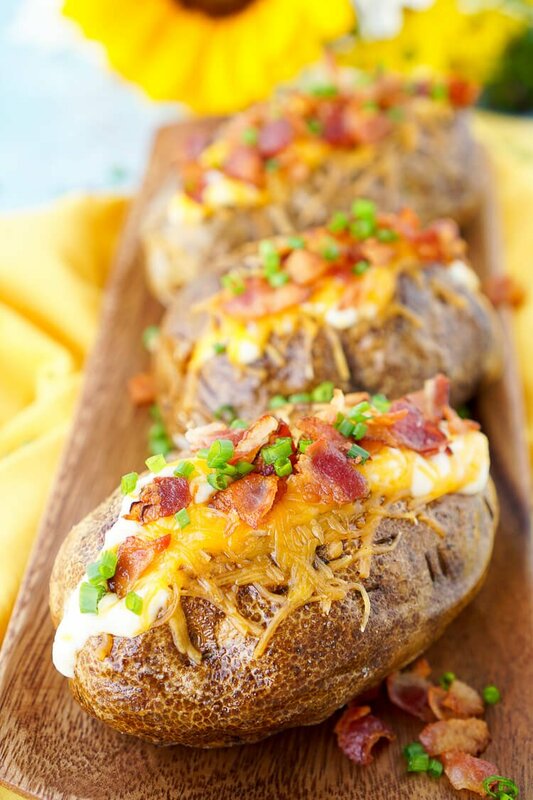 These are the Best Ever Baked Potatoes, they’re perfectly seasoned and loaded up with a creamy dressing, cheddar cheese, bacon, and chives! I’m pretty sure family get-togethers are now in full swing for the summer and everyone is divvying up who’s going to bring what when it comes to the good stuff (food). 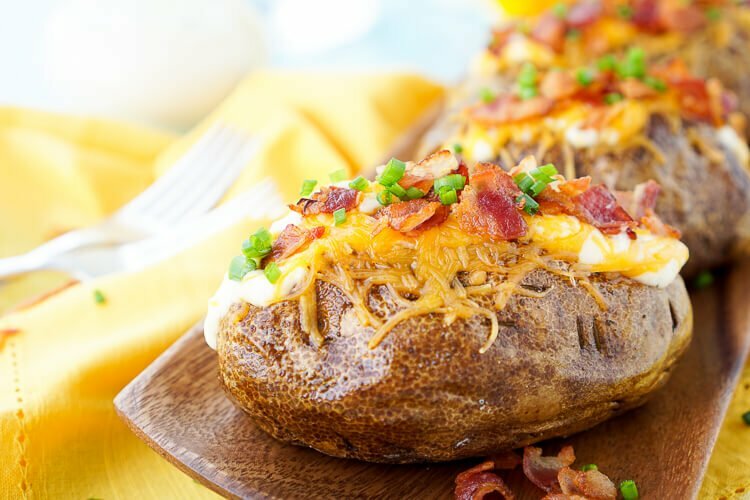 Well, I don’t know about you, but Baked Potatoes should totally be on that list, and if they’re not, something might be wrong with you. Kidding! 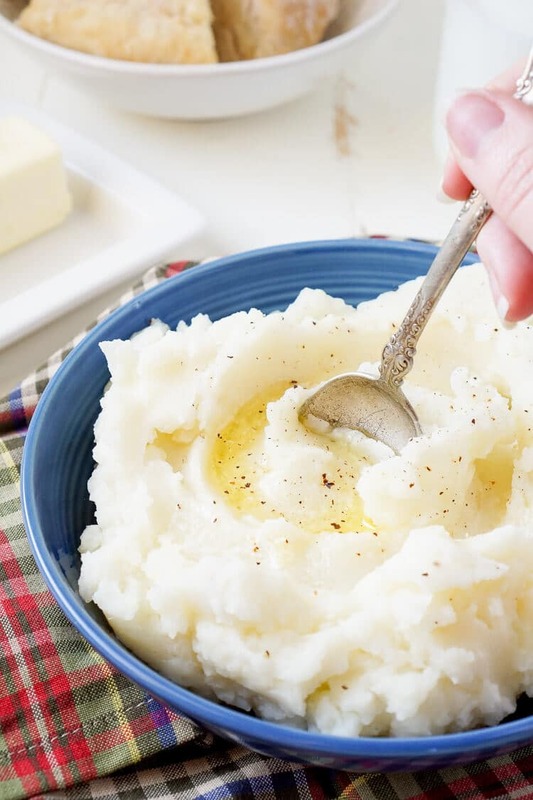 Maybe it’s because potatoes are the largest crop grown here in Maine, and it’s not uncommon for mashed potatoes, fried potatoes, and baked potatoes to all be served on big family occasions. If it’s summertime, swap out the mashed potatoes for potato salad and you’re good to go! 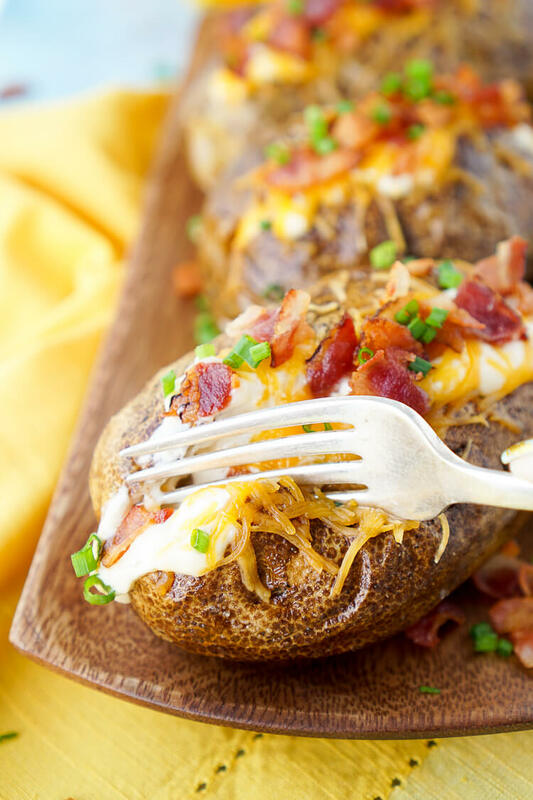 Now, the key to the perfect baked potato is the prep, because if you don’t prep them right, that’s it, game over. First of all, I don’t care what you (or my husband) says, a baked potato is cooked in the oven, not the microwave. You just can’t beat the oven crisped skin of a russet potato, yes, those are the best kind to use! And it’s so important that you rub the skin over with olive oil, salt, and pepper before baking, and don’t forget to poke it with a fork so the steam can escape. 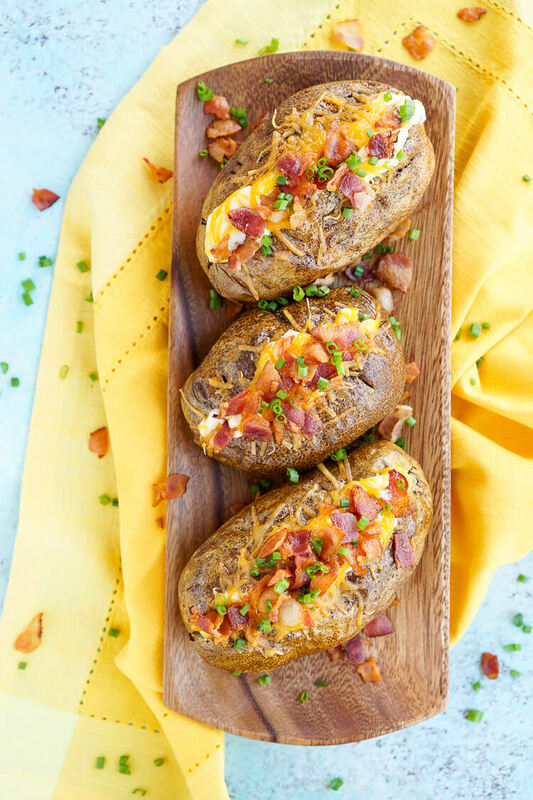 Florence’s family recipe is on point, and from there we’ll add cheddar cheese, bacon, and chives to really finish this epic side dish off! Seriously, add this to the menu for your next get together and you’ll see why we love it so much! Thank you, Florence, for sharing this wonderful recipe with us. If anyone else is interested in submitting a reader recipe for a chance to receive an Amazon gift card, click here. 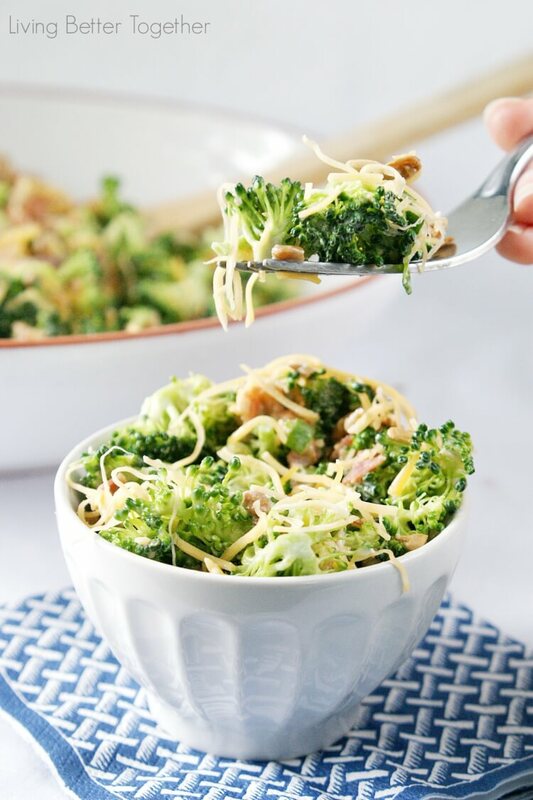 Combine dressing ingredients in a small bowl, wrap and place in the fridge for flavors to meld. Dressing can be made days ahead of time, but at least a couple of hours for best flavor. Clean potatoes and rub skin with olive oil with your hands or a basting brush.Sprinkle the entire skin generously with salt and pepper. Prick the potatoes several times with a fork. Bake directly on the oven rack or on a foil lined baking sheets for 50 to 60 minutes. Turn the potatoes once or twice during the baking process. Potatoes are done when the skin is dry and crispy and the potato is tender when a knife is inserted. 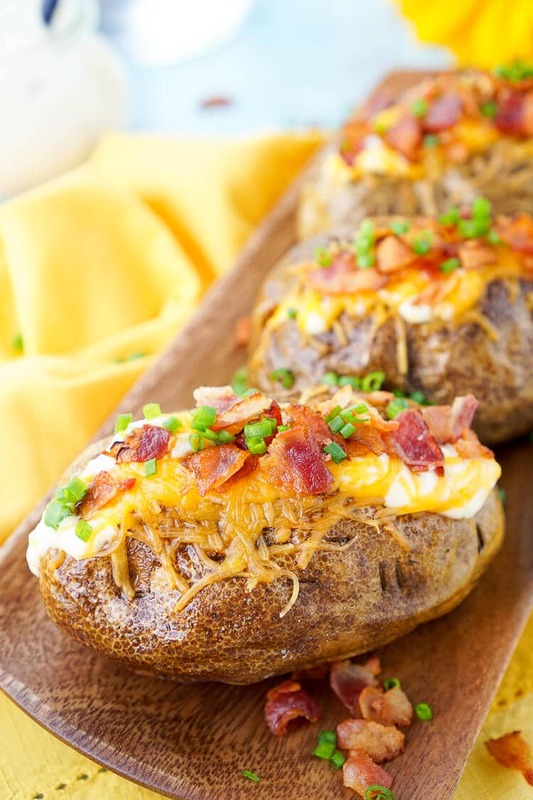 Once potatoes are done baking, slice the potatoes open and spoon in some of the dressing, top with shredded cheese, cooked bacon pieces, and chives. I love the story behind this recipe and CAN NOT wait to try this!! Isn’t it sweet? You’re going to love these! 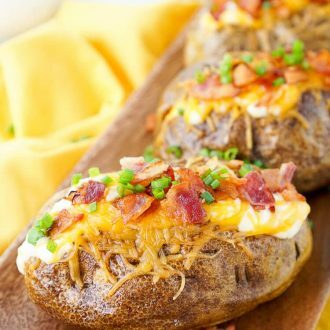 I agree, baked potatoes are best in the oven 🙂 Can’t wait to try these! I really love loading mine up and the sauce is such a wonderful addition!